Future City Media Workshops, part of the Detroit Digital Justice Coalition, presents Social Media Strategies from Egypt’s Revolution to Detroit’s Economy, the first of a bi-weekly Saturday Speaker Series. Atef Said (Egypt, Human Rights Attorney and Organizer), who was interviewed in this month’s Critical Moment. 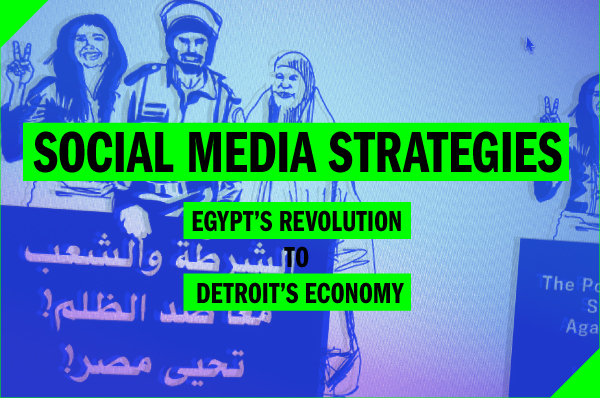 Social Media Strategies from Egypt’s Revolution to Detroit’s Economy is an open workshop and discussion examining how social media was an instrumental tool in voicing the people’s frustrations and aspirations during the ongoing revolutions in Egypt and across the region. Featured speakers from the Middle East and North Africa will discuss how the combination of building community online and off brought the power of the people together. This workshop will also share best practices and how-to guides in using social media tools. From twitter to texting, attendees will learn how to build communities and opportunities with social media technology.